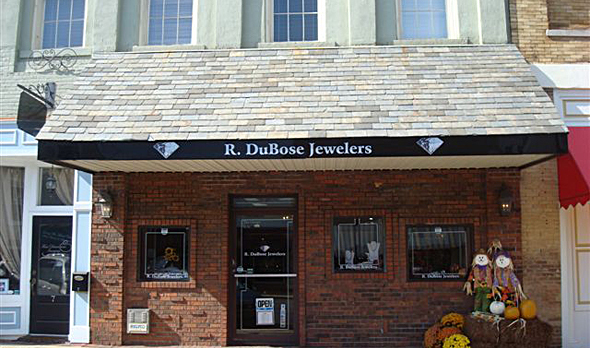 R. DuBose Jewelers was established in 1912 and are preparing to celebrate the 100th Anniversary. Ray and Linda have owned and operated their Newnan jewelry store since 1990. The owners are in and available to help you with your jewelry and bridal gift needs. Ray's great grandfather was a young baptist minister needing to supplement his income to support his family of seven. Personal service is exactly what R. DuBose Jewelers is all about. From diamonds to our Bridal Gift Registry, every customer receives our careful attention. DuBose opened his first jewelry store in 1912 in the Eastcoast Florida town of Fort Pierce. At one time the DuBose family had stores in Vero Beach, Melbourne, Fort Pierce, Port St. Lucie, Stuart and Okeechobee, Florida. Four generations later the DuBose's are still selling diamond jewelry and helping brides and grooms. Ray takes annual diamond buying trips to the Diamond Caption of the world, Antwerp, Belgium and Linda keeps tuned to the latest bridal trends at International Bridal and Gift fairs. The Newnan store has been a center of community life since the early 1930's, helping folk celebrate all of life's special events. Personal service is what R. DuBose Jewelers is all about. From diamonds to our Bridal Gift Registry, every customer receives our careful attention.